With so many kinds of explaining in today’s world, how can you be sure that someone is doing the right kind of explaining when explaining something to you? Specifically, how can you tell if Mr. Nibbins from seventh period math is mansplaining, whitesplaining, Damonsplaining, or just ‘splaining you algebra? Read on to find out! This is a tricky one, because while Mr. Nibbins technically is a man and technically is explaining, he may not necessarily be mansplaining. Listen to his tone as he talks about solving for x or the need to find the slope when graphing a linear equation. Is he, a man, telling you how you should think about these things? Does he seem to believe his personal opinions about coefficients are more important than yours because he’s a man? If the answer is yes, and not just that he’s a math teacher and it’s his job to explain math, then you just may have a mansplainer on your hands. This is another tricky one, because Mr. Nibbins is pretty ethnically ambiguous. He can roll his r’s super well when he explains stuff to Consuela, the foreign exchange student, but that could also just be because he studied Spanish in college or something. You also think you once heard him say he was “going to a seder at his girlfriend’s house,” but that doesn’t mean he’s Jewish, and either way, you can definitely be Jewish and a whitesplainer (also, he has a girlfriend —ewwww! ), so play this one by ear. Damonsplaining is perhaps the easiest form of explaining to pinpoint, because it only happens when world famous actor Matt Damon explains something to you. 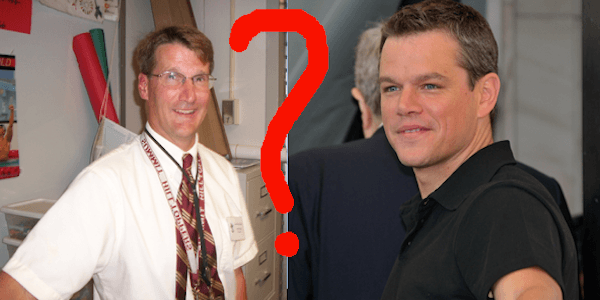 So if Mr. Nibbins isn’t Matt Damon, you can safely assume he isn’t Damonsplaining. (However, are you absolutely sure he’s not? Have you seen his birth certificate or checked his head for evidence of a bald cap?) The odds of this are low, but until you know for sure, it’s still a possibility. If none of the above apply, Mr. Nibbins is probably plain old ‘splaining. So there you have it— simple ways to figure out exactly what kind of explaining Mr. Nibbins is doing when he explains stuff like polynomials and average rates of change. And remember— just because it’s his job to explain math to you, doesn’t mean you can’t explain explaining to him.